Relays have been around since the year dot, but solid state (ie electronic) relays are much newer devices. They don’t have any moving parts that can wear out, can be triggered by tiny currents but can in turn switch enormous currents, and can be tweaked to do quite a few interesting things. A relay is simply a remote-triggered switch. Traditional relays use a set of switching contacts and an electromagnet. When power is applied to the coil of the electromagnet, the contacts are physically pulled across, closing the switch. Using Relays is a good grounding in relays and their automotive uses. Traditional relays suffer from two problems. The first is that the more heavy duty a relay is (that is, the more current it can switch), the greater the current that’s drawn by the coil. This is because the switch contacts need to be larger (and so heavier), and the contacts need to be closed with force. These aspects require a strong electromagnet that draws higher currents. The second disadvantage is that traditional relays wear out. The contacts tend to arc (especially when opening) and the contact faces get pitted. The more operations they perform, the faster they wear out. 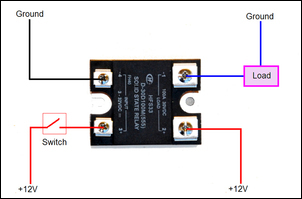 However, a relay is a cheap and effective device, one which because of the variety of switch contacts that are available, can also be very versatile. 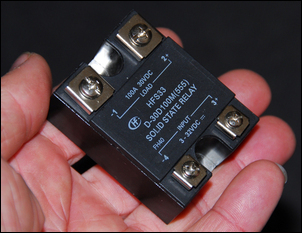 In addition to never wearing out, an electronic relay can potentially switch very large currents. When equipped with a suitable heatsink, the relay shown here can handle 100 amps continuously and cope with a very short term switch-on current gulp of 240 amps. Those are huge numbers. Electronic relays can be triggered with extremely small currents – for example, 20 milliamps. With traditional relays, only very light duty units have such low coil currents. The very low operating current has major advantages that we’ll come to in a moment. Finally, an electronic relay can be pulsed very fast. Nope, we’re not talking about just switching on and off a few times a second, but instead being pulsed hundreds of times per second. In applications like motor speed control and light dimming, and injector/solenoid operation, this has major positives. The Jaycar SY4086 solid state relay costs about AUD$40. (Oh yes – that’s a disadvantage; electronic relays cost more than mechanical relays!) It’s made by Hongfa Relay and its data sheet can be downloaded by following the link at the end of this story. The relay has four connections. The ones marked ‘input’ are connected to power (anything from 3 to 32 volts DC) to switch the relay on. Note that these connections are polarity conscious – positive must go to positive and negative to the car’s chassis or negative terminal of the battery. Here is the relay wiring. 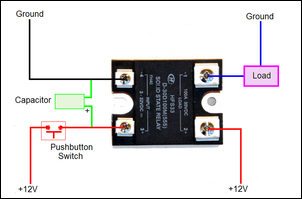 In this diagram the relay is operated by a switch. Close the switch and power is applied to the left hand end of the relay – what in a mechanical relay would be the coil connections. This switches the relay on, so allowing current to flow to the load (the load could be a lamp, pump, motor, etc). Here’s the same diagram but in this case the one power supply feeds the relay the juice needed to switch it on and also powers the load. 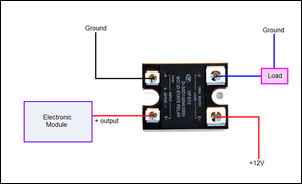 Finally, the electronic relay can be switched on and off by another electronic module – if the module outputs any voltage between 3-32V DC, it can be used to switch the electronic relay. The most obvious use of an electronic relay is to replace a traditional relay. However, in most automotive cases this isn’t worth doing. To replace existing relays, much rewiring will be need to be done and unless the existing relays are being used in an application that is causing them problems, no real benefits will occur. However, there are some cases where it would still be a positive. For example, in a car using really high powered driving lights, and where the lights are switched on and off a lot, traditional relays may have a short life. The electronic relay would then be a good upgrade. A better use is to use the electronic relay where only a small switch-on current is available. For example, sensitive pressure switches, micro-switches and many temperature switches are rated for very low currents. 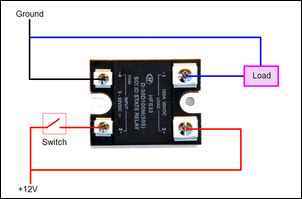 But because of the low current draw of the electronic relay, these switches can be used without problems. 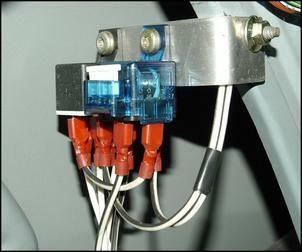 Existing switches such as radiator temperature switches and oil pressure switches can also be used without problems. However, the output transistor of this module is limited to 10 amps. That’s a fair bit but not enough current to speed control big motors like radiator fans or fuel pumps, or happily pulse multiple car horns (eg as an alarm indication). 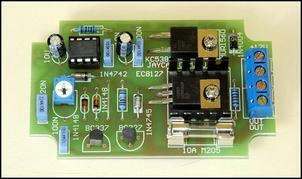 But by using this module to trigger the electronic relay, each of these uses becomes possible. However, note that there’s a trick to it. Rather than outputting 12V when the Nitrous Fuel Controller’s output is switched on, this module connects to ground when switched on. Therefore, the module connects to the ground line of the relay input rather than the positive side of the input. If more than a tiny current is available to trigger the relay, it’s very easy to add an extended ‘on’ time to the relay’s operation. This could be useful if for example an intercooler water spray is being operated by a pressbutton switch – you push the switch and release it and the spray continues for (say) 10 seconds. To achieve the extended ‘on’ time, all that’s required is a capacitor wired across the input side of the relay. A 4700uF, 25V cap, for example, extends the ‘on’ time for about 7 seconds. To increase the delay, increase the capacitance. These capacitors are polarised, so make sure that the negative lead of the cap (shown by a line of minus symbols on its body) goes to the negative connection of the relay input and the positive side goes to the positive relay input. Cost of such a capacitor is only about $2. There’s one other thing to keep in mind when using an electronic relay. On inductive loads (eg those with coils like solenoids, injectors, motors and horns) a big voltage spike is produced when the power is turned off. To protect the relay, a diode (eg 1N4004) should be wired across the load, band on the diode towards the negative side of the relay output. When working at very high current levels, the electronic relay covered in this story requires heatsinking. 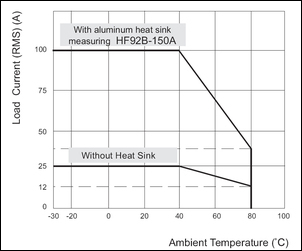 As this graph (taken from the data sheet) shows, at up to 40 degrees C ambient the relay can handle 25 amps continuously. At higher ambient temps (like found in an engine bay, for example! ), the relay is de-rated. If high currents need to be handled, bolt the relay to a large heatsink (using thermal grease between the heatsink and the metal back of the relay) and check that the relay does not exceed 40 degrees C in operation. In many cases traditional relays are still the best pick for the job. These applications include those where multiple switching contacts are required, cost is a factor and switched currents are small. But where large currents need to be handled, only very small currents are available to energise the relay, or where delayed ‘on’ times or high speed pulsing are required, the electronic relay is unbeatable. Want to build your own home workshop? Here's how to begin.